A Royal Fairy Tale for All Ages! Please note: all patrons, regardless of age, need a ticket. Here at ChiIL Mama we love The Marriott Theatre for Young Audiences series. They present excellent theatre in the round shows to spark the excitement of kids of all ages, and nurture a new generation of theatre lovers. I'll be out for the press opening on 3/3 so check back soon for my full review. We're also elated to partner with Marriott once again on a ticket giveaway for ChiIL Mama's readers. to Hans Christian Andersen’s THE EMPEROR’S NEW CLOTHES, at The Marriott Theatre for Young Audiences. Winner's choice of dates/times pending availability. Good through May 5, 2018. Enter through midnight 3/14/18. 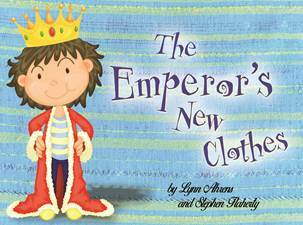 An inexperienced Emperor learns an important lesson on his journey to taking the royal throne through Lynn Ahrens and Stephen Flaherty’s lively musical adaptation of Hans Christian Andersen’s THE EMPEROR’S NEW CLOTHES, at The Marriott Theatre for Young Audiences, 10 Marriott Drive in Lincolnshire, from February 24 through May 12, 2018 with a press opening on March 3 at 10:00AM. A charming exploration of vanity and humility, this winsome and whimsical musical will be directed and choreographed by Amanda Tanguay, with music direction by Ryan T. Nelson. Fourteen year old Emperor Marcus the Third finds himself in a predicament as he hopes to gain confidence to take the throne by obtaining the finest attire to wear. In promise of a magical wardrobe that is “invisible to fools, liars and anyone you should ignore,” Marcus gets hoaxed by a Swindler into donning a rather revealing set of garments. The only person that can help Emperor Marcus out of this mess is Arno, a simple-hearted palace mop boy. 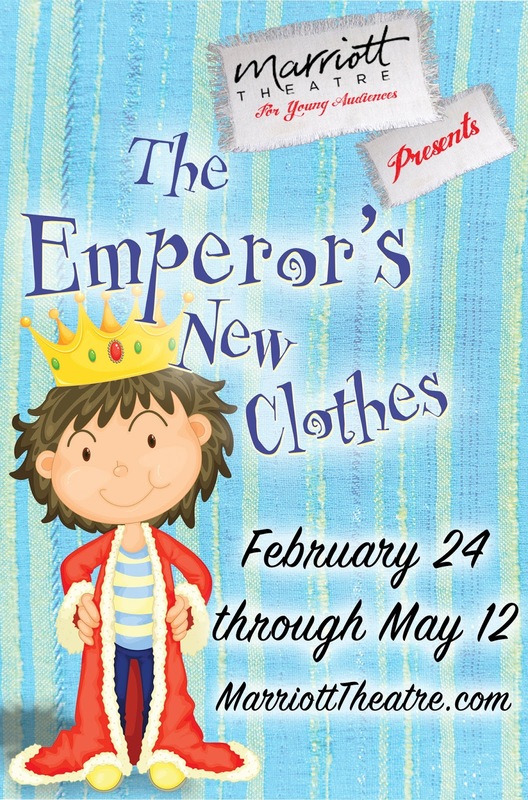 This beloved fairytale is sure to delight audiences of all ages as they learn an important life lesson about being true to yourself, doing what’s right, and the clothes you wear! Starring in THE EMPEROR’S NEW CLOTHES will be a cast of Chicagoland all-stars, including Declan Desmond as Marcus, Garrett Lutz as Arno, Johanna McKenzie Miller as Swindler, Christine Bunuan as Deena, and George Keating as William. The production will feature set and properties design by Christopher Rhoton, lighting design by Lee Fiskness, and sound design by Robert E. Gilmartin. THE EMPEROR’S NEW CLOTHES runs on most Wednesdays through Sundays at 10 a.m. with certain performances at 12:30 p.m. Visit MarriottTheatre.com or call 847.634.0200 for exact schedule, as show times and dates may vary. Single ticket prices are $18.23 per person. Groups of 20 or more receive a discount by calling 847.634.5909. Free parking is available at all shows. To reserve tickets, call the Marriott Theatre Box Office at 847.634.0200 or visit www.MarriottTheatre.com.